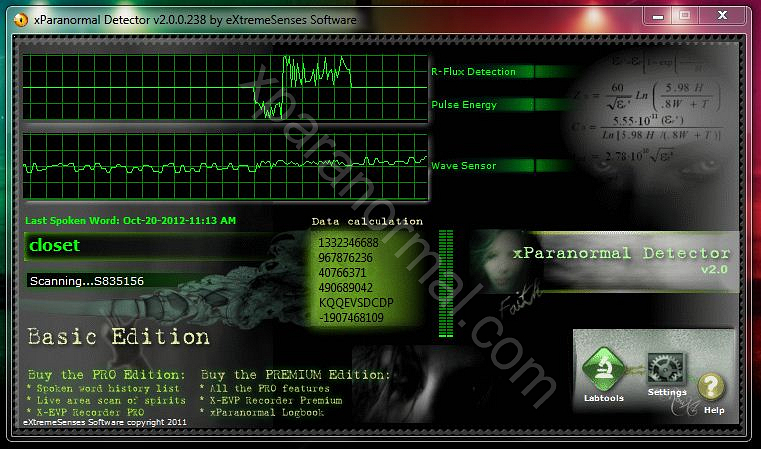 XParanormal Detector is an application designed to try to detect paranormal activity in your surroundings. It attempts to detect paranormal activity by using various electronic peripherals of your computer on which it is running.It uses your existing computer hardware to measure abnormal changes and detect vibrations and energy to help any spirits communicate with you. Each reading is analyzed from various adapters you already have in your computer. XParanormal Detector uses a unique algorithm to analyze the energy flux (based on the Rapid quantum-flux). Readings from either your Wifi adapter and/or network adapter are analyzed to detect Rapid QUANTUM Fluctuations. Interpretations of the readings are displayed graphically in two scopes and blips on the radar (PRO version only) along with numeric and textual readouts using your windows TTS engine. Use XParanormal Detector to discover odd changes in the flux with your laptop, netbook or desktop computer. Paranormal hunters of all types may find anomalous areas of their environment where a reading simply can't be explained.The theory of what is happening is that intelligent energy can be made aware of their ability to influence the electronics of your internal adapters. The various readouts are an interpretation of certain readings from your Wifi adapter or network adapter. An intelligent energy (entity, presence, spirit or ghost) should be able to influence the readouts and communicate with you. What those readings mean and how you interpret them is up to you to decide. Note: results from this application cannot be verified scientifically and therefore XParanormal Detector should be used for fun and entertainment purposes only. XParanormal Detector does not guarantee to detect ghosts, nor does its name imply that they exist. But it might, and they might.